In 2011, a team of us at McGill released the SALAMI dataset of structural annotations of lots of music; it was the largest dataset of its kind at the time, and still is. Unfortunately, it has never been easy for other researchers to obtain the audio data: we can provide all the metadata required to identify the tracks, but we don’t own the music so we can’t sell it. I recently updated a hobby project of mine to Github. The goal was to make an image feed where all the images would have matching edges, but where these edges could evolve over time. I’d still like to tweak it and add new types of designs, but a version of it is finished! HAMR (Hacking Audio and Music Research) is a hackathon event that has been held many times since 2013, and as a satellite event to every ISMIR conference since 2014. I attended this year’s event held at Deezer and really enjoyed it! To team up with others and try to solve a new research problem ASAP was exhilerating—it was almost like trying to solve a puzzle hunt. Earlier this month, I was invited to give a talk at the European Music Research Conference. I presented an overview of three recent research projects that all grew, in part, from a shared motivation: to understand musical structure—the way a piece of music is organized—not as a flat, one-dimensional, holistic phenomenon, but as a set of conflicting views of a piece, each view with its own rationale, the various rationales sometimes in conflict and sometimes in harmony each other. In my last year at AIST, I worked on two projects related to nonnegative factorization, and both have been accepted to ICASSP! Even better, each will be delivered at an oral session. As of February 1st, I have started a new position at Ircam and CentraleSupélec. I am a post-doctoral researcher on a project called “Dig That Lick”, which will analyze melodic patterns in jazz music on a large scale. Today was my final day at AIST. I am moving to Paris to start a new post-doc at IRCAM! It’s been a wonderful three years here in Goto’s lab, and I am really grateful to everyone in the lab who helped make my time here so enjoyable. Last week I attended ISMIR 2017 in Suzhou, China, and once again it was an excellent conference, with a high-quality scientific program (every talk was interesting and well delivered) and top-notch hosting from the National University of Singapore: terrific food and venues, and the chartered shuttles to and from the airport saved lots of people a lot of time. Our article about the CrossSong puzzle is now print! The article was published in the Journal of New Music Research (JNMR) with Open Access, so everyone can view the full article online. I’m also pleased to announce a major update to the online demo of our system. Earlier this summer, both articles I worked on were accepted to this year’s ISMIR conference. Last weekend I submitted the camera-ready copies for both of them, which I’m sharing now. Last year, I helped to advise two colleagues on separate projects, and both were recently published. The projects and first authors are: “Modeling discourse segments in lyrics using repeated patterns”, by Kento Watanabe; and “Probabilistic Transcription of Sung Melody Using a Pitch Dynamics Model” by Luwei Yang. I’m proud to announce the publication of Mathemusical Conversations: Mathematics and Computation in Music Performance and Composition, a book I edited with Professors Elaine Chew and Gérard Assayag. Music and mathematics have deep historical connections that affect both fields today, and each chapter discusses some aspect of this relationship. You’ve just remembered a great video you saw on YouTube several weeks ago, and want to share it with your friend. But what was the video again? Welcome to my rejigged website. After years of writing HTML by hand and hosting at my alma mater, I’ve made the full leap to Jekyll management and GitHub hosting. I used this nifty template from Barry Clark as a basis for the site. 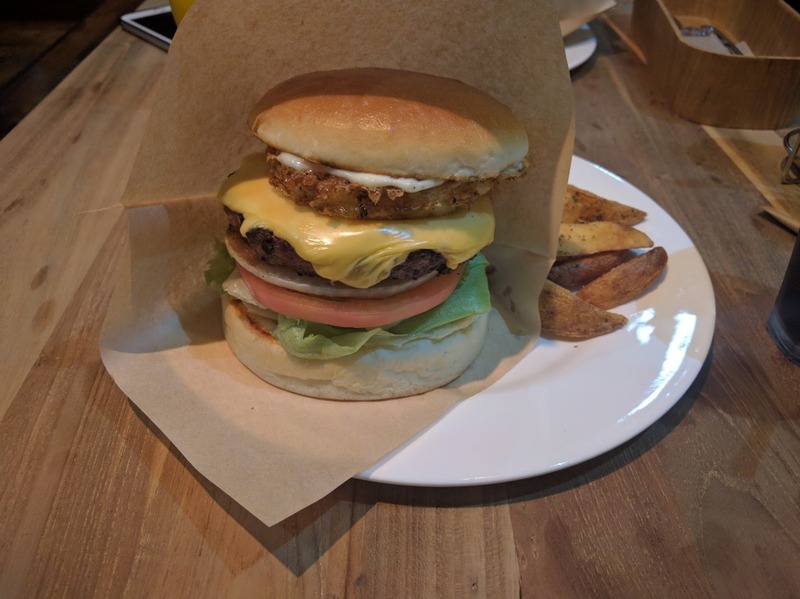 A few days after visiting McDonald’s, I got a much, much, much better tsukimi burger at 0298 Burger. See that gorgeously crisped layer above the cheese? That’s a perfectly fried egg. Simply mouthwatering. I feel bad implying that there’s a comparison to be made between the McDonald’s food-like product and this work of art, but so be it. I keep expecting the burgers at 0298 Burger to not be as delicious as the last time, but it hasn’t worn off at all. On this visit, I brought a friend and introduced him to the restaurant. His appetite helped drive the point home. After having an avocado cheese burger, he considered the menu again and ordered a blue cheese burger. As he waited for it, he had second thoughts (seconds thoughts? ), but then it arrived, and he bit into it, and it was just as delicious as the first burger. He finished it quickly. You know how when you’re having a steak, the meat can lose its oomph after a few bites, and you need either a pinch of salt or a swig of red wine to refresh your palette? I’m sure the folks at 0298 recognized and addressed this problem because they sell a perfect burger where every bite is as good as the first.